17 FebYouth Hip-Hop Classes Now Available! 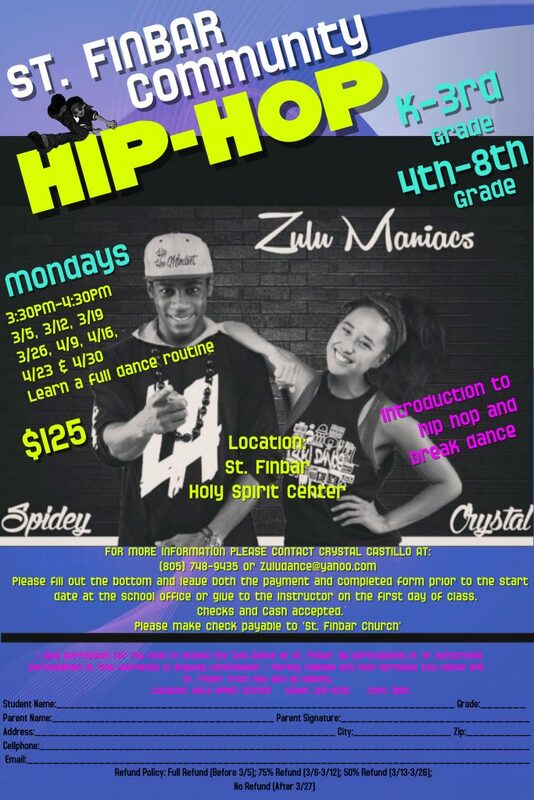 We are excited to announce St. Finbar Church Community’s First Youth Hip-Hop class with Zula Dance Foundation! We welcome all youth from our community to come join this class and have a fun time dancing! Zulu Dance is a program taught by Crystal Castillo and Spidey who are devoted to enriching the lives of children through dance. Hip-hop, break-dance, and the history of hip-hop. Fun choreography, special dance games, and uplifting music are used to cultivate every child’s confidence. Zulu Dance strives to show every child the true meaning of hip-hop, which is peace, love, unity, and having fun! Registration forms are available in the school office and the parish office!